Excellent range of settings, including very energy-efficient cold washes and fast spin. Zanussi ZWD14581W front-loading 7kg washer-dryer: pictures. The bearings on our old washer/dryer died suddenly. They let out some real smoke (March 2009) in the middle of a 1200rpm spin. In great haste we managed to select a replacement, from our favourite mid-range manufacturer, Zanussi. This machine will, unusually for the UK, allow a wash in unheated water. With our inlet temperature varying between 10C and 20C, and washing detergents now advertised to work down to 15C, we may be able to do without heating the water at all much of the time. Especially in summer, this might save ~90% of the energy needed, or ~1kWh/day. The newer machine claims to use 1/3rd less water per kg of wash. Also good. I prepared a spreadsheet to compare the various models that I looked at. The sust-it.net site was very helpful. The Energy Saving Trust was not though, as it refuses to endorse any washer/dryers even though it does approve the separate appliances. Not all of us have the space for two appliances or even intend to use the dryer other than very rarely! I've taken EST's CEO to task over this, but no one seems to even understand the point. We dry laundry on a line outside whenever possible, and failing that inside. We only resort to the tumble-dryer in desperation when (for example) there are not enough clean dry clothes for one of the children. Tumble-drying uses a lot of energy and is best avoided whenever possible. We've been testing the performance of the new machine vs the old one. We can't measure water consumption but we can measure energy and time. You can see the washes we've measured below. I can also report that the new machine seems reasonably quiet. Other than the complexity of operation that we deliberately bought into, is easy to use. It has nice features such as being able to pause a wash to add a missed sock, the display of time remaining to finish the wash, automatic reduced wash time (and energy consumption) for smaller loads. Also there is a start-delay feature not used yet but which may help us reduce CO2 emissions by doing washes at night. As of August 2009 maybe half our washes are Cotton Proportional/Jetsystem+ 30°C for normal soiling, maybe 20% are Cotton cold washes, and most of the rest are Cotton Eco Proportional/Jetsystem+ 40°C. We rarely do anything else at all (eg 60°C, delicates, etc). If we can obtain a detergent (like Tide Coldwater HE in the US) then the proprortion of cold washes, especially in winter, my go up, thus saving more energy. One downside from doing mainly cool washes (40°C or lower) is the potential for build-up of residues and bacterial growth (eg 'biofilms'). Zanussi recommends a hot (60°C/90°C) wash at least once every six weeks. We can take the opportunity to tackle stubbon stains on towels (etc), while retaining most of the amortised energy savings on average! The same applies to such other appliances such as dishwashers. While they can generally be run on more eco-friendly settings, they should once in a while be run on a hot setting to flush out accumulated grot. The load in the machine at the time gets extra attention too! 2017/03/13: when doing the maintenance wash or one immediately after, we use "extra rinses" to help ensure that any grot displaced by the heat doesn't end up deposited on the washing. We now aim for one maintenance wash per week (ish), as for our dishwasher. Cotton Eco Proportional 60°C <1kg 80m 0.66kWh 10°C Test wash of some stubbon stains with Ariel Excel gel worked reasonably well, but note that it is much more energy efficient per kg to run a full load. Cotton + Prewash 40°C ~5kg 142m 1.11kWh 19°C Run with 9h delay to take advantage of low grid carbon-intensity but finishing when we were up to avoid being left to crease. The prewash runs at 30°C according to the manual. May be worth using overnight instead of 60°C on full loads for a long and intense wash.
Cotton Eco Proportional 40°C ~7kg 90m+ 0.91kWh 11°C Used for about 30% of washes as of August 2009. For heavy soiling, as it is probably the most thorough warm wash. We can use our 'normal' (cheap/effective Tesco-own-brand) tablet detergent at this temperature. (Consumed 0.62kWh with a ~19°C inlet temperature.) The "Extra Rinses" feature seems to take 20m--30m more. Cotton + Prewash 30°C ~5kg 135m 0.65kWh 19°C Run with 9h delay to take advantage of low grid carbon-intensity but finishing when we were up to avoid being left to crease. The (~25m) prewash runs at 30°C according to the manual. (Another slightly larger load used 0.76kW still with 19°C inlet.) May be worth using overnight instead of 40°C on full loads for a long and intense wash.
Cotton Proportional cold ~3kg 60m 0.16kWh 10°C On a test wash we didn't skimp on the Ariel Excel gel and only extremely stubbon old stains defeated it; new soiling including chocolate and nappy leakage came out fine. Used for about 20% of washes as of August 2009. Suitable for lightly-to-normally soiled loads at least in summer. We found that both the Ariel Excel gel and the Fairy non-bio gel did very well in a cold wash as soon as inlet temperature hit 14°C, the former getting biro and ingrained stains out of our yellow sofa cover and the latter getting carrot (etc) out of our baby's top. Increasing the load size increases the cycle time (eg ~5kg takes 90m) but apparently not the energy use, though a very small load (~1kg) seems to drop energy use a little to 0.13kWh. Cotton Proportional cold ~5kg n/a 0.18kWh 12°C Run with extra rinses and with a 4h delay to start ~3:30am to take advantage of minimum grid carbon-intensity; set night-spin-suppression feature for quiet and to avoid creasing. Leaves clothes in final rinse water and agitates every few minutes. Subsequently ran 15m 1400rpm spin bringing total to 0.25kWh. Cotton Superquick cold small ~45m <0.1kWh perhaps 10°C Consumption too small to measure with usual meter (2015/03/22). Synthetics Normal 30°C ~5kg 75m 0.44kWh 10°C Failed to shift some very heavy soiling (c/o a leaky nappy) on one item, but generally OK.
Synthetics Normal cold ~4kg 90m 0.1kWh 10°C Was followed up by a 1400rpm spin (0.05kWh) to make sure that line-drying would not take too long. Synthetics Proportional cold ~2kg 40m 0.06kWh 11°C Initial wash time estimate was 70m, but after 5m dropped to 35m remaining. Good wash of variety of non-heavily-soiled items with half dose of Ariel Excel gel. ~90% energy saving over typical warm cycle, and with half-dose of detergent, same cost as one 30°C/40°C tablet (~10p). Delicates cold ~2kg 55m 0.04kWh 13°C Washing one business suit; even 1/2 dose of Ariel Excel gel Colour caused excess foam, so would reduce for another time. Handwash cold <1kg 50m 0.02kWh 10°C Not effective with standard (30°C) detergent, but fine with Ariel Excel gel. Synthetics (cool) tumble dry - ~3kg 50m 0.73kWh - Power consumption ~1kW. Rinses - ~2kg 48m 0.11kWh 13°C Includes spin at 1400rpm. Off - - - - - Appeared to draw ~0W when 'off' at the machine; maybe 3W with display active, eg at end of a cycle. (Original meter readings ~2W/5W; revised with better meter 2014/06/10.) May still be worthwhile switching off at the wall when not in use, which was also a sensible safety measure with a toddler who had been caught crawling into the drum more than once. Note: "Proportional" cycles are labelled "Jetsystem+". Note that a 10°C increase in wash temperature (or equivalently, a 10°C decrease in inlet temperature for a warm/hot wash) typically increases consumption by > 0.25kWh for a medium-to-full load. So all washes other than cold take an extra ~0.25kWh+ in winter vs summer, and thus cold washes are especially energy-saving in winter. By way of comparison, here are my notes/observations for the old machine. Consumes a few W (2000MU-UK reports 2W) even when apparently 'off' at the machine with the power light off, which is bad: definitely one to switch off at the wall. 0.74kWh for our typical full 40°C wash. 0.91kWh for a 60°C wash of towels with a 13°C mains inlet temperature (the manual specifies 1.10kWh, 63l and 145m for that wash, ie 0.22kWh and 12.6l per kg of washing; our replacement ZWD14581W is 0.17kWh and 8l per kg). 0.59kWh for a 30°C 'worn once' wash with a 10°C mains inlet temperature. 0.79kWh for a 40-minute tumble dry of a half-load. The water inlet valve takes about 10W when open, slowly turning the (front-loading) drum up to about 300W peak (<150W average) and up to ~600W peak while ramping up to high spin speed, and the heating element takes 1.7kW. Main bearings failed 2009/03/17! We intend to test cold (and 30°C) washes with detergents such as Ariel Excel gel (which I belately noticed is bio in the versions that we bought) which claims to be able to clean effectively down at 15°C, the new non-bio version of the Excel gel with the same 15°C claim, and the Fairy non-bio gel for which I cannot find a low-temperature claim on P&G's Web sites. Ideally we'll locate a 10°C-capable product that we can use year-round, not just in summer when the inlet temperature will approach 20°C. Which? looks at what happens to your clothes and bills when you change your washing machine temperature to 30, 40, 20 or 60 degrees. I discovered that P&G sells a 4°C-rated detergent in North America but doesn't want to sell it in the UK which, brand machinations aside, I regard as scandalous. Unilever (Persil brand and others) on the other hand says that most of its liquid detergents (not capsules) will work down to (are tested at) 10°C though performance will be better at 30°C. Much better. We've found "small&mighty" effective (and prefer the fragrance). To reduce the CO2 emissions associated with doing laundry the most obvious course of action is to reduce the energy associated with each kg of laundry done such as with a more efficient machine and/or a lower wash temperature. Our new machine should do both of these. The other tactic to reduce CO2 emission for laundry is to shift the time that the wash is done to a time when less CO2 is emitted for the same electricity consumption which can save somewhere in the range of 10% to 33% for the UK/GB grid if the wash is shifted to late at night and away from day/evening peak demand. This may be particularly worthwhile for those occasions when a hotter wash is required, for example for a "maintenance wash". Cold washes use relatively little energy and with relatively low peak demand and so are less of a priority to shift. For households on an "Economy 7" or other similar cheap-off-peak tariff, shifting the load can also directly save money. Our new machine has a delay feature which is enough for this. Set the load up ready to go, put on the 'night spin suppression' feature to keep it quiet, set the wash to start somewhere between about 11pm and 7am when grid "carbon intensity" (and thus emissions per wash load) is lowest, and the bulk of the wash's energy will be taken at the start of the programme to heat the water. Bingo! Up to a third lower CO2 emissions to do your wash.
You might not be able to sleep with the washing machine running, even if like ours it can run in a night/quiet mode. You might find the clothes more creased than usual even if the machine does a "rinse hold" as ours does in night mode and gently agitates the load in the final rinse water until you are ready to drain and spin and remove the load. It is possible that, for example, our night/quiet mode which supresses spins within the cycle not just at the end may possibly reduce rinse effectiveness or require more water. 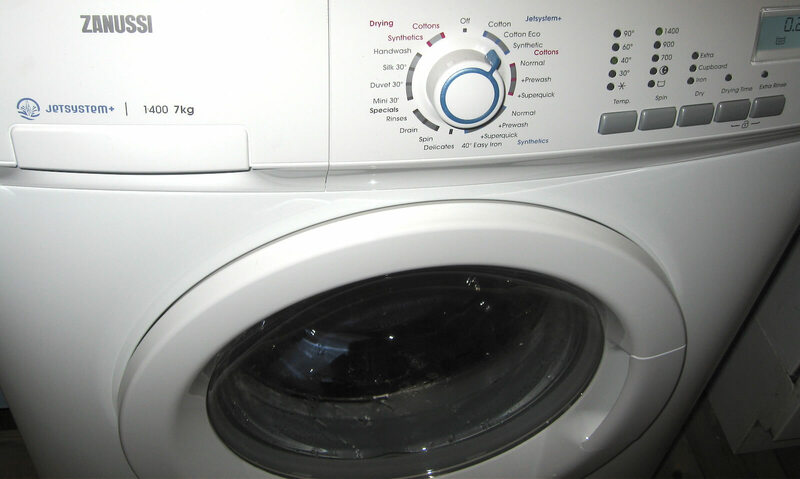 The machine will use a little energy keeping the electronics alive while waiting to start and after the wash is done, and in rinse-hold mode to agitate the clothes. On a very low-energy cold wash this might negate the emissions savings. You will have probably to manually start the drain/spin cycle yourself, though this will typically only take 15 minutes to complete. So, the hotter the wash the higher the likely benefit of running overnight, and timing the delay so that the wash will finish just before you get up (but starts well before 7am) will probably avoid creasing too. Photos of Zanussi ZWD14581W front-loading 7kg washer-dryer, and the expired Zanussi ZWD1260W. Michael Bluejay's take on laundry energy use and wash temperature where he agrees that maybe 90%+ of the energy consumed will be water heating if you're not washing (and rinsing) cold. First published 2009-03-29 , updated 2019-04-22 . Site copyright © 2007-2019 Damon Hart-Davis. Hosted by ExNet.